Nelson Ireson June 29, 2012 Comment Now! You've known the Mercedes-Benz CLS Shooting Brake was coming for a while now (and you even saw the leaked photos and details this morning), but the time is finally here: the wagon that would be a coupe has made its official web debut. Coming during the Goodwood Festival of Speed weekend, it's a sporty, sleek take on the wagon layout, with a form factor that claims its inspiration from the arched roof of a coupe. 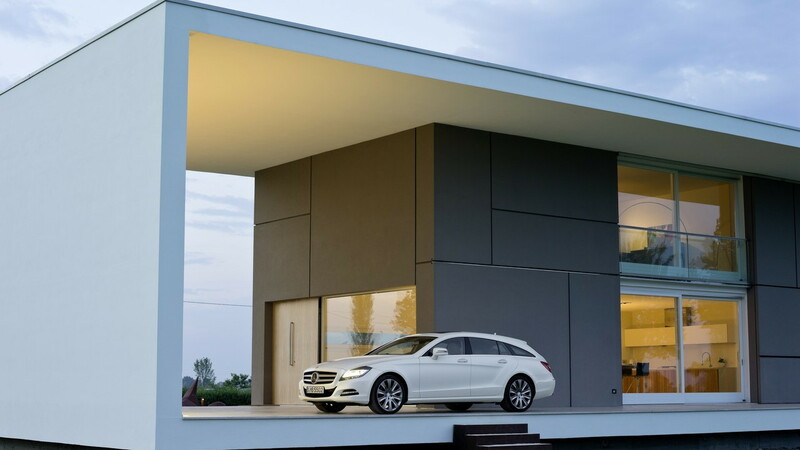 Mercedes goes so far as to say, "The proportions of the CLS Shooting Brake are surprising but clearly those of a coupé, and create a basic stance which makes it look ready for the off: the long bonnet, narrow-look windows with frameless side windows, and dynamic roof sloping back towards the rear. It is only when taking a second look that it becomes clear that the Shooting Break actually has five doors and offers "more" in terms of function. OK, Mercedes, if you say so. Whatever the words used, the CLS Shooting Brake is an elegant, streamlined interpretation of the five-doors-plus-a-cargo-area theme, so much so that we think it would even have a chance here in the wagon-hating U.S. of A. But it may not be coming here at all. According to an anonymous Mercedes-Benz North America "official," speaking with Inside Line, the business case exists, but the slow movement of wagons has the company gun-shy. 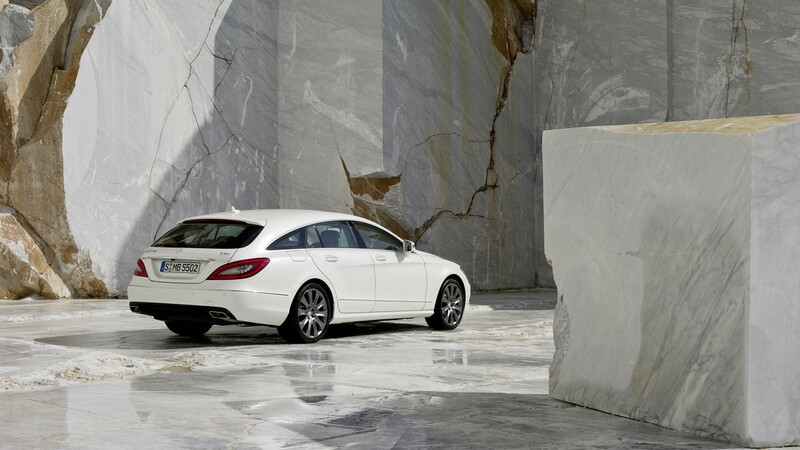 We don't blame them, as much as we'd like to see the CLS Shooting Brake on our shores. Over the longer term, however, Mercedes may be persuaded by public demand. Time will tell. So what motivates the Shooting Brake besides design? A total of four engines: two V-6s, a V-8, and a four-cylinder. Unfortunately, that's the list for European consumption. If it were to come to the U.S.--even though it's not likely--it would be solely in 3.5-liter V-6 and 4.6-liter turbo V-8 guise, wearing CLS 350 and CLS 500 badges. 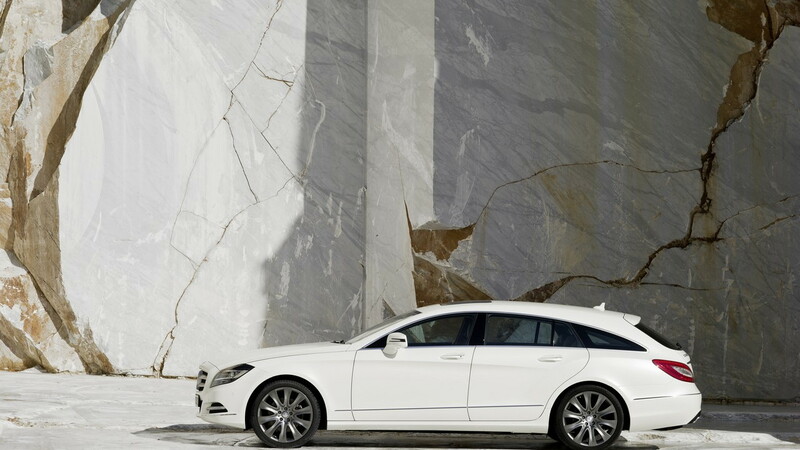 The Europeans get a 2.2-liter CLS 250 four-cylinder diesel plus a 3.0-liter CLS 350 CDI diesel. Both rear- and all-wheel drive layouts are available. As yet, there is no official word on the CLS 63 AMG version of the Shooting Brake, though our spies have seen just such a car in testing. The body, however, is the attention-getter, and it should prove useful for buyers: the cargo volume ranges up to as much as 54.7 cubic feet with the rear seats down--about 75 percent of the space of an M Class, without all of the high-riding SUV bulk. 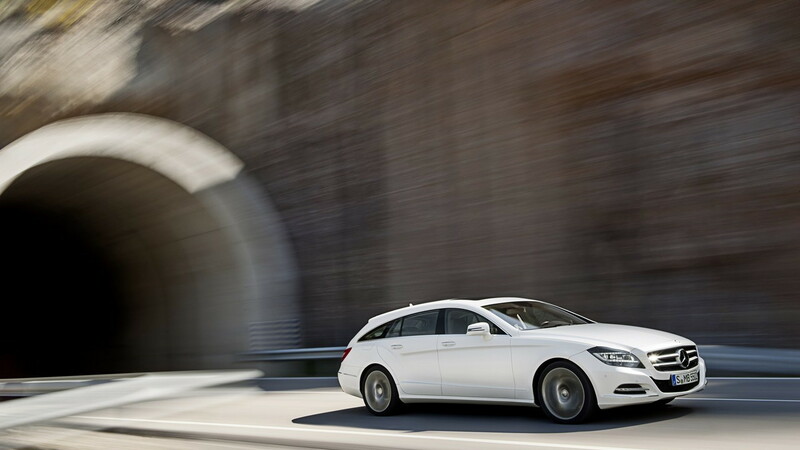 The CLS Shooting Brake is also built for lightness, with aluminum used in the frameless doors, tailgate, hood, front fenders, and of course much of the engine and suspension. The aluminum doors alone save about 50 pounds over standard steel doors. In addition to the innovative design and weight-conscious construction, the CLS Shooting Brake offers the dynamic full-LED head light system from the standard CLS, but with the addition of the Intelligent Light System previously only found on Mercedes models with xenon headlights. Adaptive Highbeam Assist, Mercedes' name for its automatic high beam headlights, has also been adapted to the optional full-LED system. "Break, or the homonym Brake, was the name once given to carriages used to "break" in wild horses and also to restrict (or "brake") their urge to move, so that they could be put to use as work horses. Since the carts could easily be broken as part of this process, people tended not to use ones which they may have urgently needed for other purposes. Where necessary, "Brakes" were often fitted out with variable bodies, which were only really used to carry along anything that may have been necessary for the hunt, for example. Any such vehicle which was used when going out shooting was called a Shooting Brake or Shooting Break. Motorised Shooting Brakes were popular in England in the 60s and 70s – exclusive two-door sports cars, which combined the luxury and style of a coupé with a larger load compartment and large tailgate." Again, whatever you want to call, or however you spell it, we'd like to see it here in America. Are you listening, Mercedes? Mercedes-Benz CLA Class Shooting Brake On The Way?